18 July 2018 – The Asian MathSci League Inc. (AMSLI) Philippine Team bagged a total of 126 medals from three different categories (87 for Math Olympiad Contest, 19 for Math Warriors Competition, and 20 for Mind Sports Challenge) during the 4th Singapore International Math Olympiad Challenge (SIMOC) held in Singapore on 07-08 July 2018. One hundred sixteen Filipino students comprised the Philippine team. The competition was held at the Canadian International School Lakeside Campus and was participated in by 17 countries: Singapore, Malaysia, Thailand, Indonesia, Vietnam, Hongkong, Cambodia, India, Uzbekistan, Bulgaria, Myanmar, China, Mongolia, Laos, Brunei, Russia and the Philippines. SIMOC is a unique mathematics competition which not only tests a student’s ability to solve Math problems on pen and paper, but also tests their skill to work in a team and play interactive Math games and puzzles. 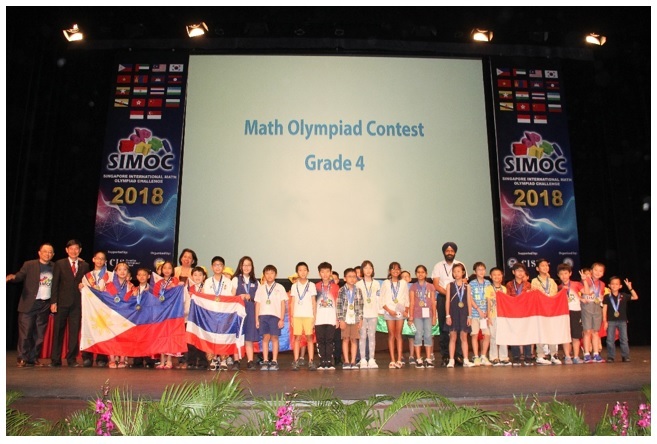 SIMOC consists of three categories: one individual written Math Olympiad Contest for grades 2 to 11 and two team-based challenges – Math Warriors Competition and Mind Sports Challenge. The Philippines brought home a total of 14 Gold Medals from all three categories (11 for Math Olympiad, 1 for Math Warriors, 2 for Mind Sports Challenge); 43 Silver Medals (27 for Math Olympiad, 8 for Math Warriors, 8 for Mind Sports Challenge); and 69 Bronze Medals (49 for Math Olympiad, 10 for Math Warriors, 10 for Mind Sports Challenge), with some students receiving multiple medals from different categories. The awarding ceremony was held at the National University of Singapore (NUS) University Cultural Centre (UCC) Theatre. Philippine Ambassador to Singapore Joseph Del Mar Yap was one of the guests of honor. He was accompanied by Asian MathSci League, Inc. (AMSLI) President, Prof. Rechilda Villame. The SIMOC group, led by Executive Director Henry Ong, also organized a day-long training for the official delegates from each country while the competition was ongoing.